(TibetanReview.net, Jan21, 2018) – Despite tight security, a low-intensity bomb exploded and two live ones were detected on Jan 19 night in the vicinity of the Kalachakra ground in Bodh Gaya, Buddhism’s holiest pilgrimage site, in the Indian state of Bihar. Tibet’s exiled spiritual leader, the Dalai Lama, has been holding a series of religious teachings on the ground, attended by tens of thousands of devotees, having arrived there on Jan 1, with plans to remain till Feb 2. Local policemen were said to have initially taken the low-intensity bomb, which exploded at around 5 pm, for a firecracker. An intensive combing operation was then carried out by a police team led by DIG (Patna Range) Vinay Kumar, Inspector General of Police (IGP), Patna Zone, NH Khan. The live bombs were discovered in two boxes, one near gate Number 4 of the Mahabodhi Temple and another near a Sri Lankan monastery, reported indianexpress.com Jan 20. The temple is situated on the spot where Buddha is believed to have attained enlightenment. The report said that following the incident, the security of the Dalai Lama, who is staying in the Tibetan temple till Feb 2, had been strengthened. The Bihar police and intelligence agencies believe they were planted by a terror outfit to create panic rather than do any major damage, said indianexpress.com report. A host of VIPs, including Bihar governor Satya Pal Malik, Chief Minister Nitish Kumar and Hollywood actor Richard Gere have visited Bodh Gaya recently to attend events with the Dalai Lama. 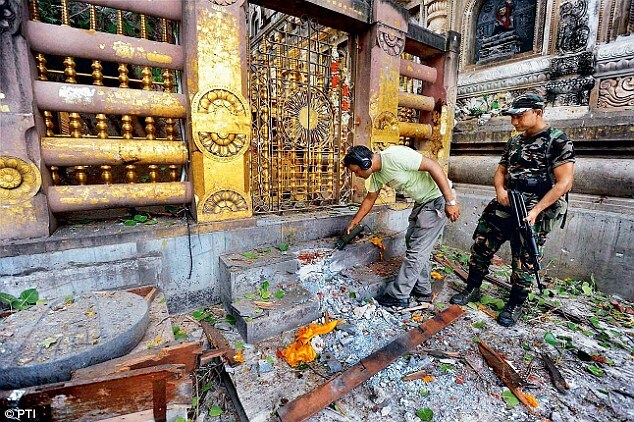 Previously, on Jul 7, 2013, the Bodh Gaya temple complex was rocked by a series of explosions. A total of 13 bombs were seen planted. While 10 exploded, three others were recovered and defused.